Although we realize a great deal of effort is usually put into the design and construction of storm water control ponds, little consideration has been given to the long-term maintenance of these important structures. 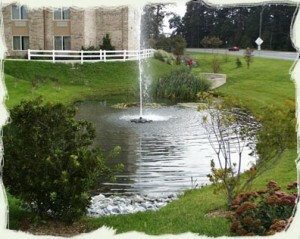 Many local ponds in the Frederick and Montgomery County Maryland area have been neglected since being built. They are in need of clearing, mowing, re-grading, having slopes re-planted and stabilized, clearing clogged inlet and outflow structures and being put on a regular maintenance schedule. We want to help your company with these important storm water pond issues and maintain the look and productivity of them. We service all areas in Montgomery County and Frederick Maryland, including the following: Potomac, Rockville, Darnestown, Comus, Germantown, Gaithersburg, Bethesda, Poolesville, Adamstown, Urbana, Dickerson, Hyattstown, Middletown, Damascus and surrounding areas.